Up until recently, the use of LED display indoors has been severely limited by the viewing distances entailed. If viewers got too close, the pixels would become quite evident so the screens always needed to be located at a safe distance. Today that has changed with the arrival of displays offering much higher pixel density. However this, in turn, has thrown up further challenges for the technology to overcome. One of these is silent operation, and another is heat generation. Most indoor LED displays are therefore now fanless and silent, however the best of them also feature DC operation immediately behind the screen and allow the AC power source to be located at a distance. This both reduces heat generation and saves on power. Screens can comfortably be located near people. Another fundamental problem with LED indoors is that of weight. In many premium retail and corporate environments finding a wall capable of bearing much weight is difficult. The best premium indoor LED options address this issue not just with lightweight construction but also with inherent strength once assembled. This enables even giant floor to ceiling displays to be suspended from the ceiling or built from the ground up. Screens with these attributes can therefore be successfully deployed in more places. Another, more obscure, problem has also come to light with indoor LED. Many LED displays are affected by a phenomenon only visible at an oblique angle where dark lines appear on the screen that make it appear in need of repair. This quirky visual imperfection is caused by ever so slight masking misalignments and there is really only one way to eradicate the problem. You use a screen with a non separable mask. At this stage, however, most indoor LED screens still use a separable mask so you will need to be careful with your choice of supplier. Some screen locations won’t display the problem but many will. It is therefore wise to seek some expert advice on the subject. The main thing to bear in mind however with indoor LED is that it is going to dramatically transform the appearance of indoor spaces in the years ahead. Fortunately for designers this transformation can entail far more than just putting giant TV screens on walls. Customised screens can be made to match the architecture instead, or be built in more abstract form for effect. You just need an appropriate technology partner to help bring your ideas to fruition. One thing is certain. 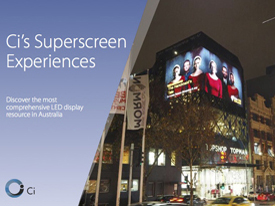 Many of your clients will be looking to utilise LED display in the very near future, especially if they are involved in retail, commercial office property, education or civic buildings. It is technology very much on the rise. Practically every LED screen that gets installed generates enquiry for several others. What LED experts Ci can do is be useful at every stage of such a project, from helping designers specify the right screen for the purpose and location right through to arranging continued supply of curated artwork if required. Ci can also make LED walls interactive like the amazing examples they installed at QUT. Ci is able to offer you all the leading LED display brands as needed: Samsung, LG, Panasonic, NEC, VideroLED, and more, as well as the astonishing new Crystal screen from Sony. Matching the right screen with your project is all part of the service, and this includes offering all the various types of LED available, from indoor to outdoor, fine pitch to wide pitch, light transparent, wind transparent, flexible, curved, ceiling tile, window or self contained. Designers are allowed more creative freedom with LED than with other display technologies. So dream first and ask questions later. If you would like to know more, download a copy of Ci’s 18pp LED Ideas Booklet, 32pp White Paper or 47pp LED Showcase document.